A 5 week Program to Explore Your Crystal Connection Through Ancient Shamanic Practices, a Splash of Science, and Creative Crystal Play. In this program you will . . . Learn how to receive messages of wisdom and inspiration from your crystal ally. Develop confidence in your ability to work with your favorite crystals and stones. Awaken your intuition and connect with your crystals using all of your senses. Discover how and why crystals heal, empower, and activate transformation. Learn how to confidently select the perfect crystals and stones for what is unfolding in your life right now. Experience practical daily spiritual practices for working with crystals. Learn key geological terms and practices for crystal identification. Work with crystal grids to amplify your personal vision and intentions. Take shamanic journeys into the crystalline realms to access ancient earth wisdom. Join Lori A Andrus for this 5-week crystal program and discover how to work with crystals as a pathway for creating a vibrant + joy-filled life! Crystals have wisdom and insight to share about what is unfolding in your life and how to actualize your dreams. And not only that, your crystal allies sincerely long to support you in your life journey. Crystals are the bones of our great mother earth. They carry deep wisdom; from earth records to creative cycles and so much more. In their own creation process they have been heated, stressed, pushed, pulled, pressed tumbled, cut, fractured, weathered, and more. Throughout history and culture crystals and stones have been used to both empower and adorn political and religious leaders . . . and for good reason. Their unique energy and frequency (in addition to their rare beauty) creates harmony within our energy field and ultimately our well-being. When you align with consciously selected crystals at pivotal points in your life journey, they are energetically supporting you to powerfully step across the next threshold and rise into your becoming. During this 5-week Journey you will . . . If you have always loved crystals and a deep part of you knows that they have healing power but struggled with the idea of it being too out there or too woo-woo this class is going to light you up and rock your world! And if you’re a little woo-woo you will find this playful class to be exactly what you need to take your crystal love to the next level. During class one we will dive into all of the science basics for creating a solid foundation for your spiritual work with crystals and stones. We are going to explore how they heal and the geological basics from how they were created to crystalline structure, formation, hardness, scratch test and how all of that affects their unique energy and healing properties. Yep, we are going to play in this lab like class! But don’t be confused, this isn’t geology 101 . . . it’s a fun and creative twist on crystal science. You will learn geological terms and practices including: crystal structure, hardness, scratch test, rock type (igneous, metamorphic, and sedimentary), and so much more. Our work with crystals and stones needs a solid foundation . . . both in the area of science and in confidently selecting the perfect crystals to work with, activating them with your intention, and feeling clear about how to care for them. In this class we will dive into some of the most frequently asked crystal questions so that you can feel clear and confident every time you select a new crystal and embark on a journey together. In this class you will . . . Explore practices for selecting your perfect crystals (muscle testing, pendulums, through your senses, and more). Learn how, when, and why to cleanse your crystals. Activate your crystals with intention. Other crystal basics such as why a crystal breaks and what to do with it when it does, how to care for and store your crystals, and so much more. Crystals and stones have so much wisdom and insight into your sacred journey. As soon as you step into this journey, you will recognize how they are beginning to inform you in new and creative ways. Their wisdom and messages go far beyond what is shared in the books as just like you, they too are evolving. As you work with them with clear intentions, they reveal powerful and specific insights and wisdom for your life journey. During this class you will be guided to . . .
Attune your energy body to the crystals energy and open your intuitive channels. Receive messages, wisdom, and insight from your crystals through divination practices and dream exploration. It’s time to cultivate a living relationship with your crystal allies. As you begin to infuse every facet of your life with crystals, this is where the true magic begins to unfold. In this class you will explore . . .
How to work with crystal to create your home as a sanctuary. How to activate your sacred spaces with crystals. How to amplify and focus the energy of your intentions with powerful and creative crystal grids and altars. How to select and work with crystals for creativity, abundance, and protection. Crystals and Shamanism go hand in hand. In this class you will experience the realms of the crystals and stones through the lens of a shaman. Shamanism is both a practice and a way of being in the world. Shamans cultivate a deep connection of honor and reverence with all of life. In this class you will learn more about what it means to live shamanically as well as learn how you can work with ancient shamanic practices to connect with the crystal realms. Learn how to create and work within sacred space. Work with the sacred art of smudging. Experience a shamanic journey into the crystal realms for deeper insight into your relationship with your crystal allies. Explore other shamanic rituals that will have you connecting with the crystals in ways you never have before. Hello my crystal loving friend! Have you ever held a crystal in your hand, in complete awe of its beauty, unique markings, and the way the light dances off of it wondering if there is a way you can I unlock what feels like layer upon layer of wisdom and possibility? I have. I remember finding a stone on the beach as a little girl that left me in complete awe. I asked every park ranger I could about this stone and each time the same thing happened. The ranger would look at it with his scientific eye and then hand it back to me saying ‘this looks like a sedimentary rock.’ I felt heart broken. It was an accurate answer, but it’s not what I was looking for. I wanted to hear about its magic and why it showed up on the trail that day. I wanted to know why I felt such a deep connection. I wanted to understand its unique markings and turtle like pattern. And I wanted to unlock its wisdom. Perhaps you can relate to this desire and to the knowing that there is a very special reason your favorite crystals have shown up in your life . . . and like me, you’d LOVE to be able to connect with it more intimately. Well, it took me over two decades to learn how to do that, but eventually I did. That little turtle stone called me to the shamanic path where I learned practices and techniques to bridge the worlds and decode the language of crystals and stones. Crystals and stones are one of our most powerful allies for creating a deeply rooted life; a vibrant, healthy, prosperous, and joy-filled life. Yes, they have literally rocked my world and I have witnessed the amazing ways they have done the same for my clients, family, and my friends. As we deepen our connection with our crystals we begin to understand how they are weaving their magic in our lives to create health, prosperity, and fulfillment. This connection begins with a solid foundation . . . one that includes both the spiritual and science basics as well as daily sacred practices that cultivate an intimate relationship with both yourself and your crystal allies. If you’re ready to take your next step in life, join me for this program and create a solid crystalline foundation! The Crystal Wisdom 5-week Program Includes . . .
Each week you will receive a new class packed full of amazing crystal content! Each class includes videos, audios, soulful reflection rituals, and creative + practical assignments to work through at your own pace. Classes are fun, creative, practical, and easy to follow . . . carefully designed to guide you into deeper connection with the crystals and stones. Discover how (and why) crystals heal, empower, and activate transformation. Work with crystal grids and altars to amplify your personal vision and intentions. Awaken your intuition to connect with your crystals and the crystalline realms. Learn shamanic practices for working with crystals and stones. Have a couple questions before registering? Lori Andrus is a shaman who understands the language of crystals and stones. Thank you Lori for shining brightly and sharing your wisdom with the world! Lori is an authentic priestess and shamanic space holder of the inner soul realms for one to discover the deepest parts and truths of herself. I’ve experienced brilliantly blissful shifts into fuller integration of myself when working with her sacred guidance. Her intuitive powers have proved to be spot-on each time, and been mind-blowingly rich insight on my path. I am so grateful for her presence in my life! Lori is a gifted, soulful teacher with so much to give. I felt beautifully, wonderfully, and deeply connected to her and each of my fellow students. My heart is full, and I am so grateful for all I’ve learned and received. How much of a time commitment will this program require? The answer to this question really depends on a lot of things . . . any prior experiences you have with the practices we will be working with in this program, where you are at with your personal journey, your comfort with being creative, etc. Scheduling about 60 – 90 minutes each week for the class work is a good plan. Remember, this is a virtual program, so you do have the freedom to move at your own pace. It is designed to support you in deepening your relationship with yourself on all levels: spiritually, emotionally, creatively, physically, and more. Working with crystals and integrating what you will learn in this program has the potential to transform your life. That said, all learning requires commitment and follow through. This is a super fun program with unlimited potential for how it will transform your life. The results you will experience are reflected in how you show up for you. Will I be working one-to-one with Lori during this program? The Crystal Wisdom : 101 program is a virtual, self-paced journey. It does not include any live components. If you know you would like to go deeper into the work by working privately with Lori, we invite you to explore Lori’s services. She offers both private mentoring and shamanic healing sessions. What if I start this program and decide it is not for me? What is your refund policy? Due to the nature of this digital program all purchases are final. No refunds or transfers are available for the Crystal Wisdom : 101 Program. Are the classes live or in person? This is a virtual program and all classes are pre-recorded giving you the opportunity to work through each class at both a time that works best for you as well as at your own pace. If you know you would like to go deeper into the work by working privately with Lori, we invite you to explore Lori’s services. She offers both private mentoring and shamanic healing sessions. Program participants receive a discount on their services. No, this program is designed for your personal journey. It will guide you in knowing yourself more intimately as well as empower you to take courageous steps forward on your path. It is to support you in deepening your relationship with both your soul and with the crystals. You will be guided in crystal and shamanic practices, but you will not be trained in how to work with these processes to guide others. If this is something that interests you, I would love for you to join us for this foundational program and then further explore your crystal and shamanic work through the Journey Jewels Certification Program. Lori is a Stellar Shaman in the realm of Crystal Magic – having worked with her in a collegial relationship for a number of years I am consistently deepened in my connection to the crystal kingdom and its many gifts for the collective story of evolution every time we have a “crystal date”. Lori brings a deep devotion and new insights through from her crystal allies with grace, clarity, and a wonderful essence of joyful gratitude and true respect. If you are considering amplifying your own journey into strategic alliance with the crystal realm you are in good hands with Lori to guide you in your quest. Lori is deeply connected to her inner wisdom, knowing, and truth. Her mere presence radiates a wise soul, gentle spirit and open heart. She lovingly guides and nurtures women along their journey to discover this inherent truth in themselves. There is nothing more rewarding than living your life in sacred alignment. Lori has the knowledge, tools, and heart to help guide you into this sacred place of being. I wanted you to know just how very much I’m loving your crystal course. I’m really impressed with the amount of detail you put into your program and the wealth of information. It’s absolutely amazing and exactly what I was looking for in my personal journey. Thank you for creating it! As you step into the crystal realms you step through a portal of possibility. They begin infusing every facet of your life with magic! Say YES + begin your journey NOW! About your guide, Lori A Andrus . . .
Lori A Andrus is a modern-day priestess and advocate for the soul. Weaving the transformational practices of ceremony, ritual, shamanic journeying, and sacred creation, Lori bridges the spiritual and physical worlds awakening men and women to their true inner brilliance. Known for asking the right questions, Lori opens doors into unseen worlds connecting individuals with their inner wisdom in such a way that they take courageous action and embrace their destiny. Lori is the creator and founder of the Priestess Pathway® and the Journey Jewels™ Certification Programs. 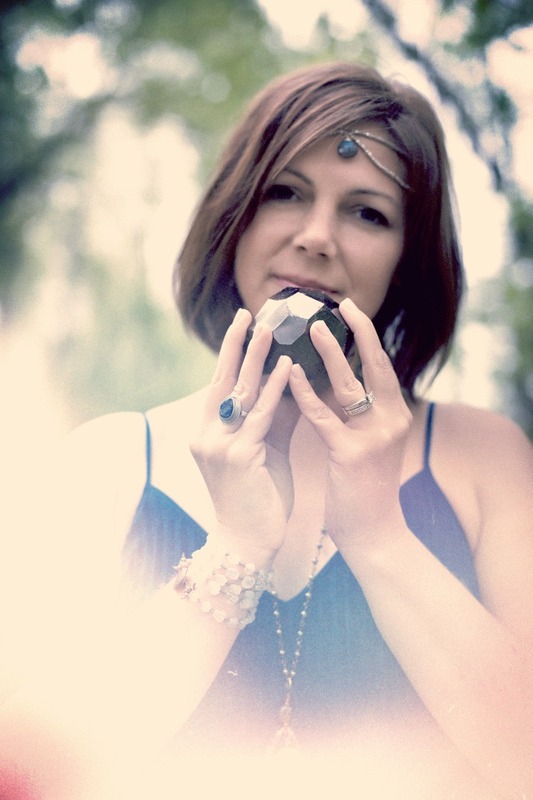 She is also the creator of Journey Jewels® jewelry and the Priestess Pathway® Podcast. Lori holds a Bachelors of Science Degree in Psychology and a Masters Degree in Occupational Therapy. She is a Graduate of The Four Winds Healing the Light Body Program, a Reiki Master, and crystal healer. Lori’s jewelry designs have been featured in Spirituality & Health magazine, selected as Best of Show at the International New Age Trade Show, and her creations are worn by women throughout the world as they move through their transformational journey. Lori has traveled to Peru to study with the high mountain shamans learning practices for ceremony, activating sacred landscapes and working with the spirit of the land. She is inspired by sacred landscapes and frequently embarks on personal pilgrimages by road-tripping to sacred sites throughout the United States. Join Lori A Andrus for this 5-week crystal program and create a solid crystalline foundation for your life!